Vathi, the capital of the island, with its port naturally sheltered in the bay of the same name, rises in an amphitheatre and has sustained its traditional style into the present, with its well-preserved aristocratic dwellings (arhontika) and neoclassical buildings. The costal road, and in particular, the long quay pulsates with life in the summer nights, which seems to transform the color of the starlit sky. Higher up, on a hill, spreads the old town, Ano Vathi, its distinctive characteristic being its cobbled lanes and old tile-roofed dwellings, which constitute at present listed buildings. The eastern part of the island is an activity center, hemmed in by picturesque settlements, small and large coves, and beautiful beaches. Eastward of Vathi, extends Kerveli, an appealing, thickly wooded area. On the other side, westward of Vathi, lies another pole of attraction, Kokkari, a picturesque, nightlife-oriented area, with fishing taverns and many tourist facilities. Karlovassia, an attractive town comprised of five separate districts, is situated on the northwestern coast of Samos, and is known for its splendid beaches and sites of natural beauty. Most ferries call first at its port, while the area's resorts and other tourist facilities, cater to the visitor's desire for a pleasurable stay. Pythagorion, the old town of Tigani, is the capital of the Municipality of Pythagorion. 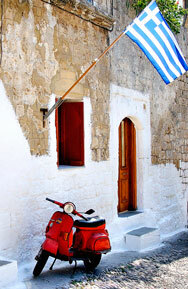 It is a beautiful picturesque town, ideal for your stay in the island during your holidays. The port of Pythagorion, constructed during the reign of Polikrates, is the oldest manmade port of the Mediterranean. Today thousands of yachts sail there all year round. The Municipal Services of Pythagorion provide the yachts with fuel, electricity, water and telephone. Pythagorion boast more than 5500 hotel and motel beds. The port of Pythagorion with more than 60 local tavernas, bars, cafes and nightclubs is considered as the best nightlife hotspot of Samos. Every morning hundreds of visitors sail from Pythagorion towards the Coasts of Asia Minor and the ancient Greek Cities of Ionia. There are also daily excursions with the typical Greek boats, the kaiki, to the amazing remote beaches of Samiopoula, Tsopela, Kako Rema, Kiriakou, Aspros Kavos and others. Amongst the picturesque narrow roads of Pythagorio we find unique neoclassical buildings, the ruins of the ancient Samos, the Square with the town hall and the archeological collection of the town. Marathokampos stretches along one of the largest bays of Samos, and is a beautifully situated are, encompassing one of the most appealing and large settlements in the island, as well as adjoining fishing villages, with many fine beaches and hotels. Situated in the northeast part of Samos, originally fishermen's village that has developed tourism. The narrow roads, the fantastic and endless beach, the tavernas, cafes and shops all make a charming village built right by the sea, with a back drop of valleys and mountains. Pebbly back in the village with sun beds, umbrellas and there are 2 beautiful pebbly beaches Tsamadou and Lemonakia. Also the northerly winds, which blow in this area, make it ideal for windsurfing.